Early in the morning, Kunjumon and his team of five are busy getting their fishing nets and other paraphernalia ready. One team member is nervous, pointing out that he has not seen the ubiquitous sea birds that frequent the zone – expressing a belief that if the birds were around, the sea would be calm. The dark sky and rain-heavy clouds are of no help. The fishermen of Kerala in South India have long sworn by the signs and portents of traditional wisdom – such as the congregation of birds, the colour and smell of sea water, bubbles breaking on the sea surface, muddy and oily water, or a clear reflection in the sea the previous evening – before venturing out to fish. Not anymore. These days, they no longer rely only on hearsay or blind beliefs. Scientific information on the weather has come to their aid, to the extent that most of them know exactly where to cast their nets, thanks to alerts from the Kerala State Remote Sensing and Environment Centre. The centre, in collaboration with the Indian National Centre for Ocean Information Services, has been working towards the transfer of meteorological technology to the coastal fishing community to benefit their livelihoods. The scene is reproduced across the country. Remote-sensing satellite data applications provide real-time information, and the forecast is achieved by correlating information on sea surface temperature, pigment concentration and other oceanic features. The scientific process takes into account other parameters such as chlorophyll, nutrients, dissolved oxygen, salinity, winds and currents, all of which are also used to study the feeding and breeding habits of fish. N C Anil Kumar, scientist at the Kerala State Remote Sensing and Environment Centre, says the fishing community in Kerala has hugely benefitted from the technology, which has resulted in larger catches as well as a significant improvement in the quality of life of many fishermen. A team of scientists from the ICAR-Central Institute of Brackishwater Aquaculture (CIBA) in Chennai, Tamil Nadu, have decided to go a step further. Scientists are soon to begin 3D mapping of brackish-water aquaculture resources available in the country in an effort to promote farming activity in the coastal areas. India has a large potential area of 1.2 million hectares of brackish water, of which only 10 per cent is being used. The country has a long history of traditional farming in brackish water in bheries (large impounded shallow water areas with facilities for drawing tidal water) of West Bengal and Pokkali fields (in which salt-resistant strain of rice and fish are co-cultured) of Kerala. 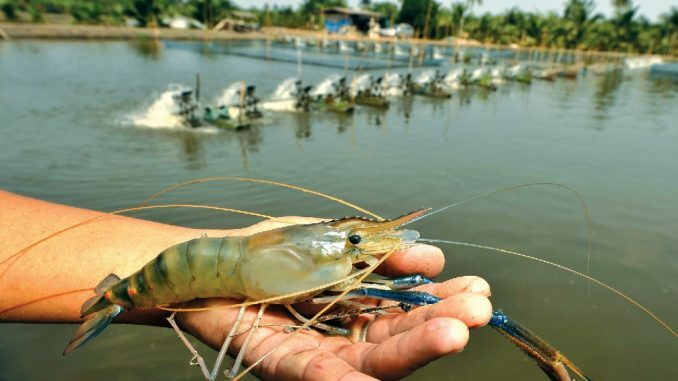 Commercial farming, however, has been confined to a single commodity, shrimp – largely Penaeus monodon (the native giant tiger prawn), and Penaeus vannamei (the exotic whiteleg shrimp) – due to its high export potential. “The brackish water salinity is between sea water and fresh water,” says M Jayanthi, joint secretary at CIBA. “India is home to a vast landscape that cannot be used for any other purpose. The available brackish-water land cannot be used for agriculture,” she adds. Given that CIBA’s aim is to enhance aquaculture production and the productivity of brackish-water aquaculture, scientists are to use satellite images as well as extensive ground surveys to map the resources available along the Indian coastline. “We are doing the mapping to understand brackish-water soil as well as nearby water resources, even as we take care of environment sustainability regulations,” says Jayanthi. “We are looking at buffer zones, so that there is no multi-user conflict. We are looking to identify suitable areas that can be ready for immediate development,” she adds. Map images acquired from satellites are to be digitised and made available online. Parallel ground surveys will measure other basic parameters such as water depth, salinity levels and dissolved oxygen. Thanks to the availability of 56,000 hectares of brackish-water lands, Tamil Nadu state has great potential to develop brackish-water aquaculture. Officials have pointed out that if the lands are brought under aquaculture, the state could considerably increase the production of shrimps, sea bass and mud crab. To kick start the project, mapping is to begin in brackish water surrounding Ramanathapuram district in Tamil Nadu. The district administration is funding the project at USD $7,651. This will be followed by mapping across the state of Maharashtra, with the Maharashtra State government sanctioning USD $61,216 for the project. The mapping will soon be rolled out to other states as well. An official with the Marine Products Export Development Authority in Kochi says brackish-water aquaculture sector in India is largely based on farming of the giant tiger prawn, Penaeus monodon. Other shrimp species – Penaeus indicus (Indian prawn), P. merguiensis (banana prawn) and P. semisulcatus (green tiger prawn) – are considered as having potential, he says, and cultivation of whiteleg shrimp (Penaeus vannamei) has been gaining momentum in recent years. Apart from the giant tiger prawn, certain brackish-water fish and shrimp species such as milkfish, pearl-spot and mullets have shown a lot of promise for commercial aquaculture in inland saline water areas. India has an estimated total estuarine area of 3.9 million hectares, of which 1.2 million hectares of coastal salt-affected lands have been identified to be potentially suitable for brackish-water farming. Of this, about 10 percent of the potential area has been put into aquacultural purpose. Recently, the culture of the non-native whiteleg shrimp has attracted farmers’ attention because of its fast growth, low incidence of native diseases, availability of specific pathogen free (SPF) domesticated strains and culture feasibility across a wide salinity range. About 9 million hectares of salt-affected land has been estimated in the hot semi-arid and arid eco-region of the northern plains and central highlands in the states of Haryana, Rajasthan, Uttar Pradesh, Maharashtra and Gujarat with surface and sub-soil saline water. The potential cultivable species in these areas include various shrimps, finfish and crabs.